Knightsbridge COB 5w LED replacement bulb Lamp Neutral White (GUCOB5CW) or Warm White (GUCOB5WW) high Output COB LED technology GU10 replacement for the classic halogen lamp. 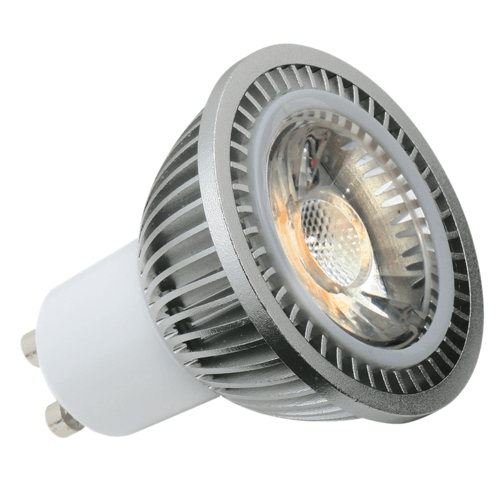 Ideal as retrofit for 50W Halogen in most areas such as wall lighting. The lens creates an appearance of a halogen lamp with the Warm White producing 400 lumens and the Cool White producing 440 lumens. Rated average hours life (subject to usage) 40,000hrs. Suitable for dimming with Leading or Trailing Edge dimmers. Comes complete with a 3 year manufactures warranty. Tested in accordance with EN60968 – Self ballasted lamps for general lighting services. CE, EMC and ERP fully certified. I needed this exact item to match the other in our living room. Arrived in good time, reasonably priced and looks the business. Thank you. What is the difference between "cool" white and "warm" white? I s one more yellowish and one whiter? Electrical World Replies: Warm White is more a Soft, Yellow Light while Cool white is more of a Bright White Colour. Electrical World Replies: Hello, Colour temperature is measured in Kelvin (K) usually bulbs have a rating such as 3500k which is white light, 4000k Is cool white and 6500k is daylight . Colours either side of this such as 2700k would be warm white or 8000k is heading toward what the eye would see as nearly blue light!